The brief contains updates to the table. On April 16, 2013, the Senate’s “Gang of 8”—a bipartisan group of eight U.S. senators—filed the Border Security, Economic Opportunity, and Immigration Modernization Act of 2013. At the core of the bill is a provision that will provide a pathway to earned legalization and citizenship for the 11 million undocumented immigrants in America. The pathway to citizenship for these aspiring Americans will be neither short nor easy. Under the provisions of the bill, most undocumented immigrants will have to wait 10 years before they can apply for legal permanent residency—a green card. In addition, most will not be eligible for citizenship until at least 13 years after the bill is enacted. Despite this long process, there are significant economic benefits to the U.S. economy and to all Americans when unauthorized immigrants acquire provisional legal status. Our prior research in a Center for American Progress report, “Economic Effects of Granting Legal Status and Citizenship to Undocumented Immigrants,” showed that legalization and citizenship bring large economic benefits to the nation as a whole. But as this brief will show, the economies of each state also stand to gain large benefits if immigrants are put on a path to legal status and citizenship. In this follow-up issue brief, we break down the economic gains for individual states. Both the acquisition of legal status and citizenship enable undocumented immigrants to produce and earn significantly more. These resulting productivity and wage gains ripple through the economy because immigrants are not just workers—they are also taxpayers and consumers. They pay taxes on their higher wages and they spend their increased earnings on the purchase of goods and services including food, clothing, and homes. This increased consumption boosts business sales, expands the economy, generates new jobs, and increases the earnings of all Americans. Each state will experience significant economic growth as well. In this follow-up to the “Economic Effects of Granting Legal Status and Citizenship to Undocumented Immigrants,” we begin by recapping the national gains. We then provide estimates of the economic benefits for states if their undocumented populations were legalized. Specifically, we estimate the increases over 10 years in gross state product, or GSP, as well as earnings, taxes, and jobs for these states if the Senate Gang of 8’s bill is enacted in 2013. We also explain why immigration reform is responsible for these specific economic benefits. The methodology for this brief relies upon estimates of the undocumented population in each state and replicates the methodology used in our previous report. If the 11.1 million undocumented immigrants currently living in the United States were provided legal status, then the 10-year cumulative increase in the gross domestic product, or GDP, of the United States would be $832 billion. Similarly, the cumulative increase in the personal income of all Americans over 10 years would be $470 billion. On average over 10 years, immigration reform would create 121,000 new jobs each year. 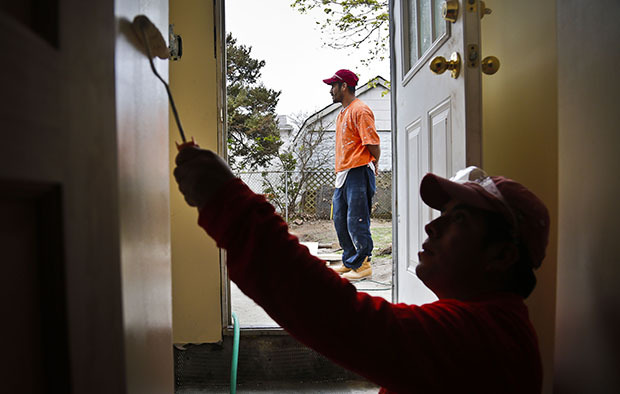 Undocumented immigrants would also benefit and contribute more to the U.S. economy. Over the 10-year period they would earn $392 billion more and pay an additional $109 billion in taxes—$69 billion to the federal government and $40 billion to state and local governments. After 10 years, when the undocumented immigrants start earning citizenship, they will experience additional increases in their income on the order of 10 percent, which will in turn further boost our economy. Across all of these states, the economic gains are significant. In Arizona, for example, the 10-year cumulative increase in GSP will be $23.1 billion, the increase in the earnings of state residents will be $15.3 billion, and immigration reform will create an average of an additional 3,400 jobs annually. In addition to these significant gains, undocumented immigrants themselves will experience significant increases in their income and pay more taxes to their states. In Arizona, for example, over the 10-year period they will earn $12.7 billion more and pay an additional $1.5 billion in state and local taxes on these increased earnings. In each of these states, when the undocumented immigrants eventually gain citizenship, their earnings will increase an additional 10 percent, further improving the economy and prosperity of all residents in their state. But since the attainment of citizenship will occur outside of the 10-year window of analysis of this study, we do not include any of the economic benefits from the acquisition of citizenship. In addition, we do not include the $69 billion in additional federal taxes that the undocumented would pay on their increased earnings. 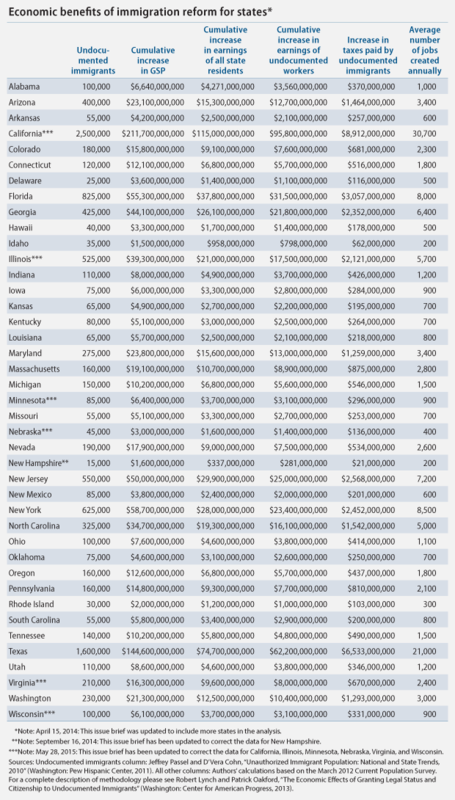 The table below provides a state-by-state breakdown of these benefits over 10 years. There are many reasons why receiving legal status and citizenship raises the incomes of immigrants and improves economic outcomes. Five main reasons are explained below. Legalization and citizenship promote investment in the education and training of immigrants that eventually pays off in the form of higher wages and output. Legal status and citizenship provide a guarantee of long-term membership in American society and cause noncitizen immigrants to invest heavily in their English language skills and in other forms of education and training that raise their productivity and earnings. Legalization and citizenship facilitate the labor-market mobility of the undocumented, which boosts wages and improves economic efficiency. Prior to legalization, unauthorized immigrants are subject to deportation if apprehended and, regardless of their skills, tend to pursue employment in low-paying, low-profile occupations—such as farming, child care, or cleaning services—where their legal status is less likely to be discovered. Thus, undocumented workers do not receive the same market returns on their skills that comparable but legal workers receive. In other words, the productivity of the legalized improves in part because workers move to sectors where their skills and education are both valued and relevant to the work being conducted. Therefore, legalization and citizenship improve the efficiency of the labor market by ensuring that people are working in fields where their skillsets and training are being used to the fullest extent. Providing legal status and citizenship to undocumented immigrants gives them legal protections that raise their wages. Legalization allows the newly authorized to invoke employment rights and increases their bargaining power relative to their employers. This means that newly legal immigrants are better equipped to contest an unlawful termination of employment, to negotiate for fair compensation or a promotion, and to file a complaint if they are being mistreated or abused. Legal status and citizenship provide access to a broader range of higher-paying jobs. Many jobs, including many public-sector and high-paying private-sector jobs, are available only to legal residents or citizens. In addition, employers often prefer to hire citizens over noncitizens. Legal status and citizenship make it easier for immigrants to start businesses and create jobs. These facilitate entrepreneurship by providing access to licenses, permits, insurance, and credit—all of which make it easier to start businesses and create jobs. Despite the legal obstacles to entrepreneurship that noncitizens currently face, immigrants are more likely to own a business and start a new business than are native-born Americans. Thus, immigration reform that unleashes this creative potential of immigrant entrepreneurs promotes economic growth, higher incomes, and more job opportunities. Undocumented immigrants are currently earning far less than their potential and therefore paying much less in taxes than they otherwise would be. Overall, they are contributing significantly less to the U.S. economy than they potentially could. With legalization and citizenship, undocumented immigrants will produce and earn more, pay more in taxes, boost the American economy, increase the incomes of all Americans, and promote job growth. This analysis of the economic impact on states demonstrates that it is not just the nation but also each individual state that will benefit from immigration reform. The sooner we grant legal status and provide a pathway to citizenship to undocumented immigrants, the sooner all Americans will be able to reap these benefits. Robert Lynch is the Everett E. Nuttle professor of economics at Washington College. Patrick Oakford is a Research Assistant at the Center for American Progress. This study was made possible by the generous support of the JBP Foundation. The views expressed are those of the authors and not necessarily the JBP Foundation.